This larva was clinging to the rear end of a planthopper which was well hidden in the vegetation. It was the white spot that caught my eye. I took the hopper home in a ziplock bag because it looked so odd; the larva abandoned the planthopper and started crawling about. Its back was well covered by waxy, dusty material. It was holding a cottony web on its belly. I can't figure out what kind of larva it is. Please watch the short video; you get more of a sense of how it moves and what it looks like from it. I removed all the stuff later on to observe more details of the anatomy. A day later it started forming a new cottony ball. Glad to know what it is; it had me stumped. Any idea whether it is native or introduced? the fact that it is the only one in the family makes me wonder. 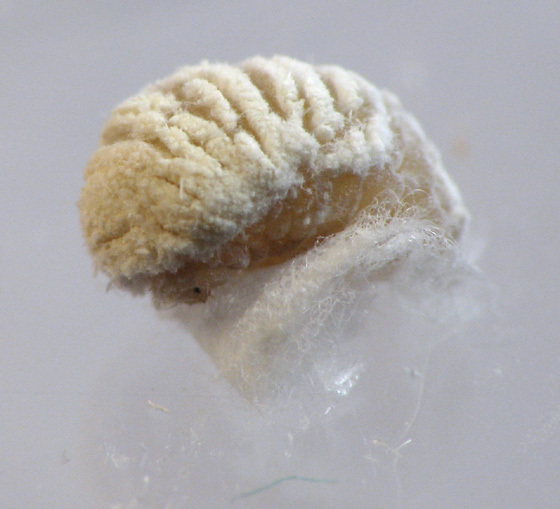 It's a planthopper parasite moth larva. I'd love to find one of these, but I'm out of their range--you're pretty much at the northeastern range limit.